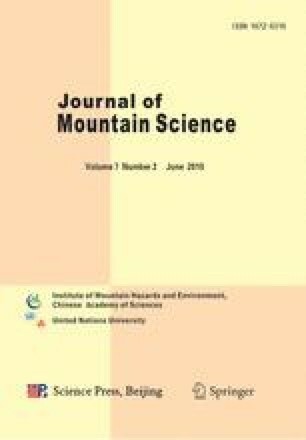 In this paper, a digital identification method for the extraction of altitudinal belt spectra of montane natural belts is presented. Acquiring the sequential spectra of digital altitudinal belts in mountains at an acceptable temporal frequency and over a large area requires extensive time and work if traditional methods of field investigation are to be used. Such being the case, often the altitudinal belts of a whole mountain or the belts at a regional scale are represented by single points. However, single points obviously cannot accurately reflect the spatial variety of altitudinal belts. In this context, a digital method was developed to extract the spectra of altitudinal belts from remote sensing data and SRTM DEM in the West Kunlun Mountains. By means of the 1km resolution SPOT-4 vegetation 10-day composite NDVI, the horizontal distribution of altitudinal belts were extracted through supervised classification, with a total classification accuracy of 72.23%. Then, a way of twice-scan was used to realize the automatic transition of horizontal maps to vertical belts. The classification results of remote-sensing data could thus be transformed automatically to sequential spectra of digital altitudinal belts. The upper and lower lines of the altitudinal belts were then extracted by vertical scanning of the belts. Relationships between the altitudinal belts based on the montane natural zones concerning vegetation types and the geomorphological altitudinal belts were also discussed. As a tentative method, the digital extraction method presented here is effective at digitally identifying altitudinal belts, and could be helpful in rapid information extraction over large-scale areas.